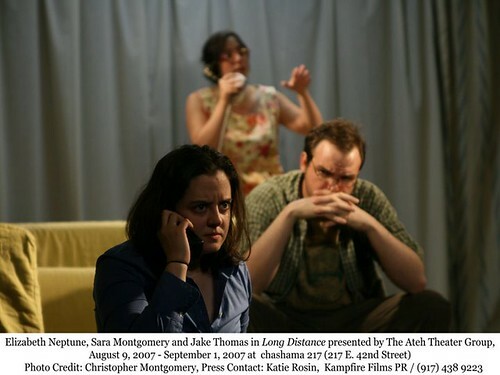 Long Distance is a new short-story adaptation from The Ateh Theater Group, the team responsible for the recent stage version of Kelly Link’s story “The Girl Detective.” But while that play was gaily zany, the new show – a tryptich of one-acts based on stories by Judy Budnitz – is more of a downer. Tales of decay and death usually are. The first playlet, Visitors, is the most lighthearted, a quirky and funny tale of family dysfunction that accelerates towards the macabre. The uptight and dreadfully nervous Meredith (Elizabeth Neptune) awaits an impending visit from her parents, who keep calling from the road as they slip into deepening trouble. But the mother (Sara Montgomery) is such a cornpone stereotype that we don’t care much what happens to her, while the increasingly freaked-out Meredith is so mean to her boyfriend Parrish (Jake Thomas) that we find it hard to drum up sympathy for her either. Fortunately, Neptune’s precisely focussed performance and Dunlap’s deadpan direction keep the action tight as it careens towards a jolting finale. Flush (you can read the original story here) sweetens its gloomy subject matter – breast cancer, and a family in which it runs – with a swirl of absurd humor, and makes its curious point about blurred identities. But despite a touching and perfectly calibrated performance by Diana Lynn Drew as Leah, a fearful mother who turns avoidance into an art form, and solid work from the rest of the cast, it’s ultimately just plain depressing. Skin Care is sad too, yet it’s the best of the three one-acts. Here Dunlap seems to get the tone just right; perhaps this story simply lends itself most readily to the stage. It’s a fairy tale, really, starring Montgomery as Jessica, a girl who goes away to college but fails to take the advice of her fretful older sister (Neptune again, here taking paralyzing panic to a scary extreme). Naturally Jessica contracts leprosy, with surprising and revelatory results, and Montgomery’s silent scenes with her props of illness are the emotional perigee of the production. In Budnitz’s world, many things aren’t entirely what they seem. When did Parrish suddenly start wearing glasses? Did Leah really see a fish in the toilet? But in this set of adaptations it’s the finale, Skin Care – the one in which the absurdity is essential rather than decorative – that gives us the clearest look into the hearts of the terrified, tyrannical, blood-and-guts-beautiful women who people Judy Budnitz’s unique imagination. This entry was posted on Monday, August 20th, 2007 at 6:37 pm	and is filed under Books, Theater. You can follow any responses to this entry through the RSS 2.0 feed. You can skip to the end and leave a response. Pinging is currently not allowed.